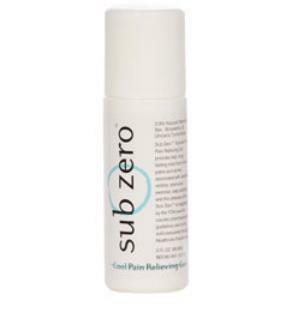 The Sub Zero™ Cool Pain Relieving Gel , 3 oz. Roll On with Cat's Claw™ provides fast long lasting relief from minor aches and pains associated with strenuous exercise, daily activities and the stresses of everyday life. The Sub Zero™ Cool Pain Relieving Gel , 3 oz Roll On with Cat's Claw™ provides fast long lasting relief from minor aches and pains associated with strenuous exercise, daily activities and the stresses of everyday life. Can be used as effective pain relief for arthritis, neck and back pain, sore muscles, sprains and spasms. Sub Zero™ contains no artificial coloring, 3.9% Menthol, and a unique herbal blend of llex, Boswellia and Uncaria Tomentosa.